Tea. Just need to practice my loaf cutting skills. 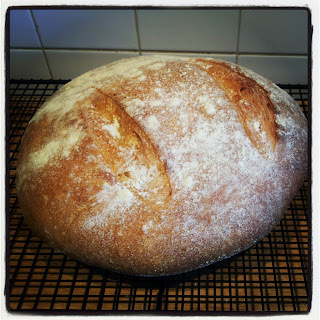 It feels somewhat appropriate that my 250th recipe is baking related (top tag with 92 recipes) and by Dan Lepard (favourite book/baker) with this being recipe 29 of his and bread recipe number 22. I didn't exactly plan it this way - I started this journey a week ago - but looking at my stats, it seemed to be worthy of comment. And so I did. 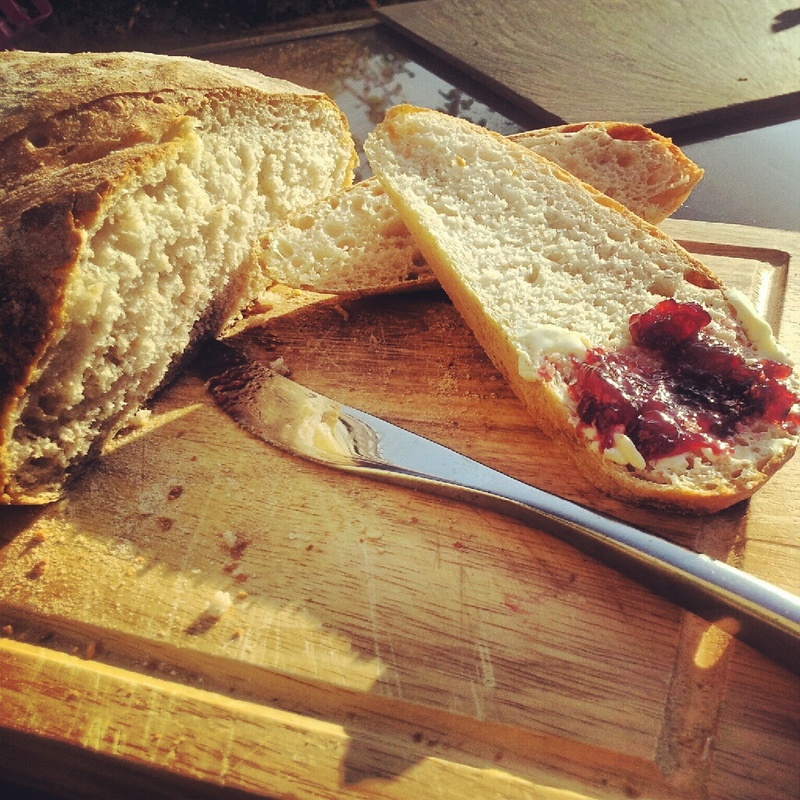 Sourdough bread appears to be the holy grail of bread baking. 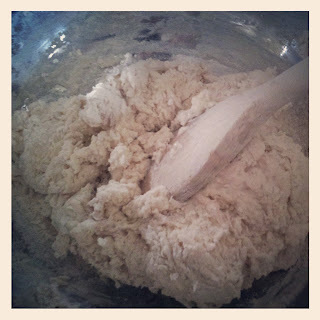 Of course, this is only me setting my foot on the very bottom rung of the ladder that is sourdough. Nevertheless, you appear to not be able to call yourself a bread baker until you've tried this feat. Why do I say this? 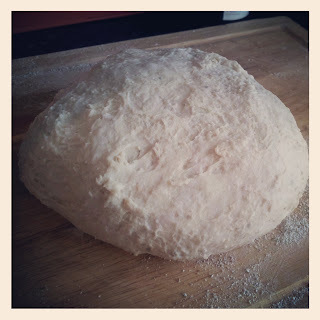 Well a while back, I was Googling the lovely Lorraine Pascale's bread recipes when I found a post questioning her credibility as a baker because she dared to make bread that didn't take a week to prepare. And this wasn't even her 21st Century Cheese and Ham Bread (which I believe you can make in less than an hour but as the husband doesn't like cheese bread, I've not tried it). 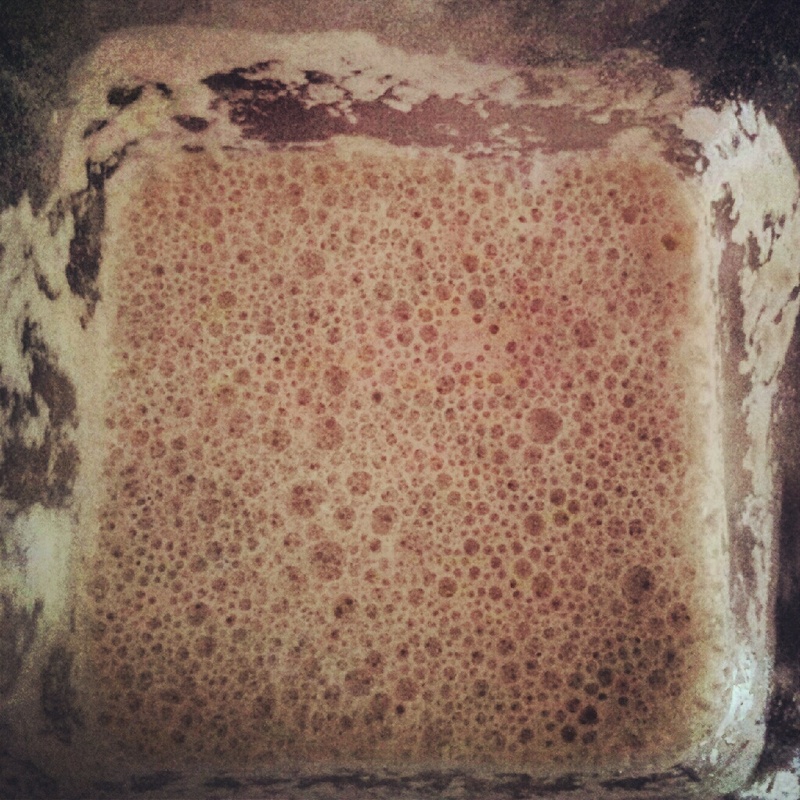 This was a regular, yeasted bread that takes around 2-3 hours from mixing to baking. But this particular blogger had a beef with Lorraine's loaf not being tasty enough for him and was very scathing about it. That post angered me that someone could be so rude and condescending. Not everyone has the privilege of being able to sit around all day waiting for endless kneading and rising and knocking back and more rising. Surely anything that is homemade is far superior to something that is bought from a shop and packed full of preservatives? 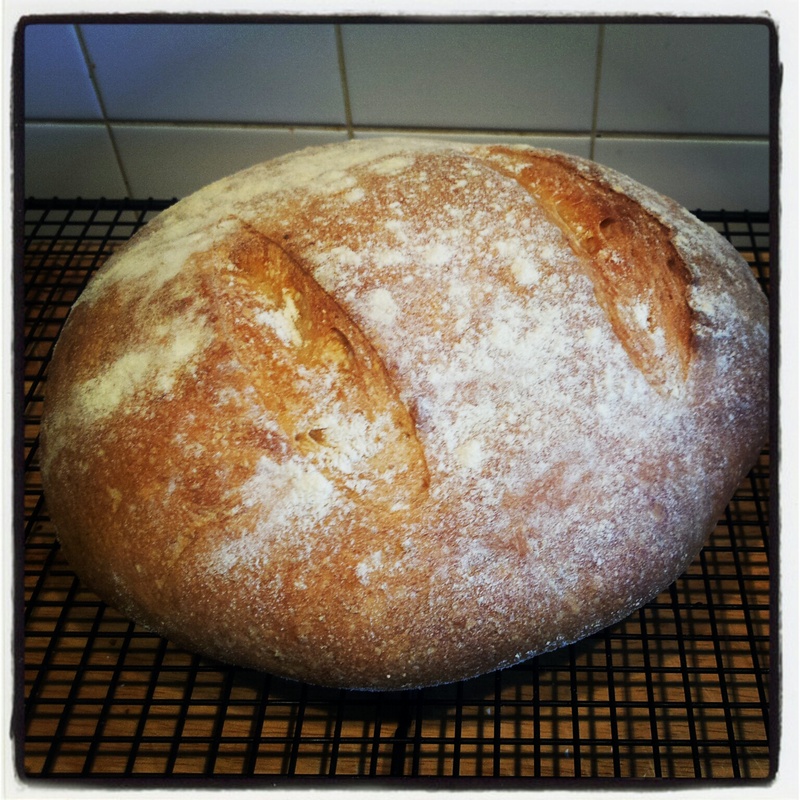 I've made plenty of nice breads over the last year, all of which used yeast. Maybe sourdough knocks the competition into a cocked hat but sometimes good enough is absolutely fine. And we're not all lucky enough to have an Artisan bakery at the end of the street - or the budget to buy all our bread there. And if this guy has an issue with Lorraine, then he will have an issue with pretty much every baker on the planet. Some people need to get their heads out from their own backsides. I wonder how he feels about Marco Pierre White advertising stock cubes or Dan Lepard revealing that he uses Smash in some of his bread recipes? The blog turned by stomach so much I didn't read further. 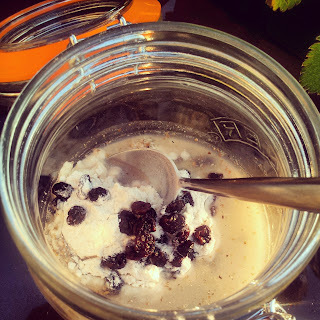 Anyhow, because this has been an epic recipe, I'm afraid you're going to get an epic post - because I have lots of pictures and another topic I need to get off my chest. Washing up! I hate it. And I only married my husband because he used to be really good at cleaning up. To the point that he'd even rotate the plates in the cupboard to make sure they wore out evenly. Post wedding, his kitchen cleaning declined and, having married someone who isn't a fan of cleaning, we often have 'disagreements' about me and my baking. Especially when bread dough is involved. 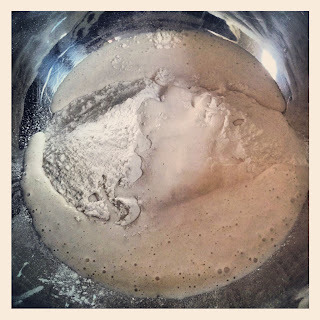 I've yet to find an effective way of cleaning bread dough from a bowl without gunking up the scrubby sponge or scrubby brush that we use for manual washing up. Then there's the issue of the bits of dough that do eventually make it out of the bowl and into the sink and weld themselves to the stainless steal before you have chance to rinse them away. So of course, when Derek (yes, I've named my sourdough after Derek Branning - a volatile character in Eastenders) decided to escape for a better look at my worktop, I knew this wasn't going to be a 'disagreement' free week in the Crowdey household. Derek has needed nearly as much attention as a small child since he first escaped. Luckily, unlike Miss A, he hasn't mastered the art of unlocking and opening the front door and letting the dogs out. But with the need to remove some of his volume (dough in the sink - see above) and carefully feed him, plus check he was okay in the confines of his new home each day, I've felt like I've had a third child to care for for the last seven days (Miss A being number one and the sunburnt husband being number two). Still, we made it through the week eventually. And this morning, before work, I began his first rise. 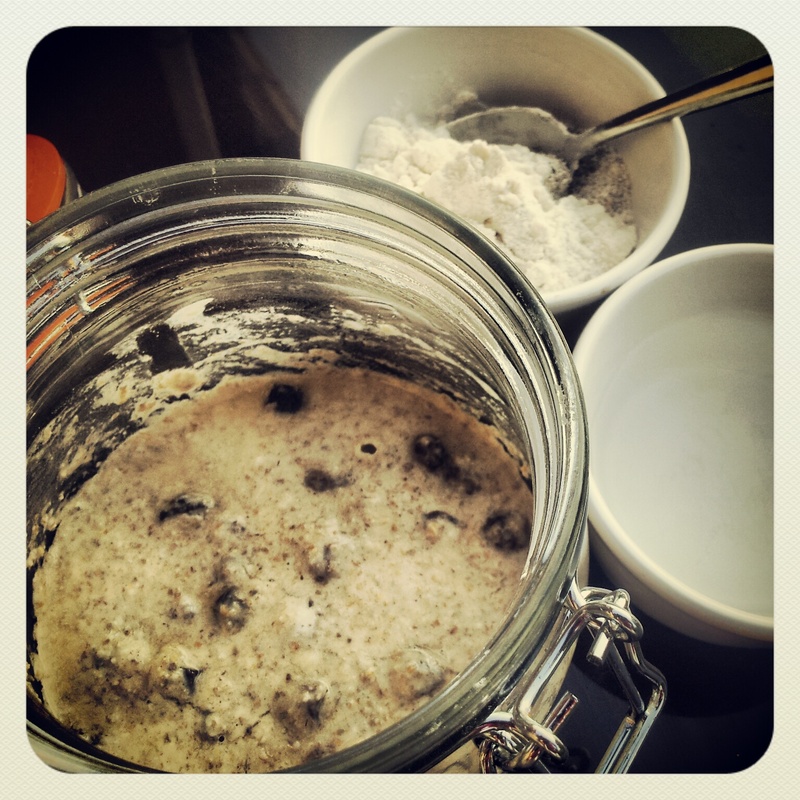 Of course being a Lepard recipe, this involves the three ten-second kneads over half an hour rather than the traditional ten minute knead. But it gave me time to make breakfast and coffee in between. 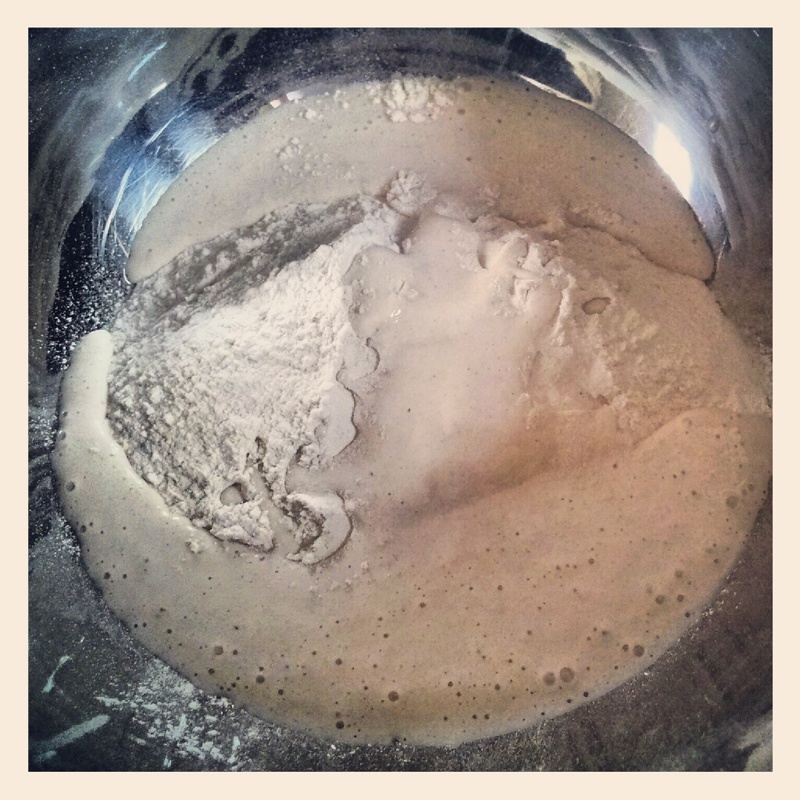 Although it's a Dan Lepard recipe, I got the instructions for the leaven from Azalia's Kitchen. 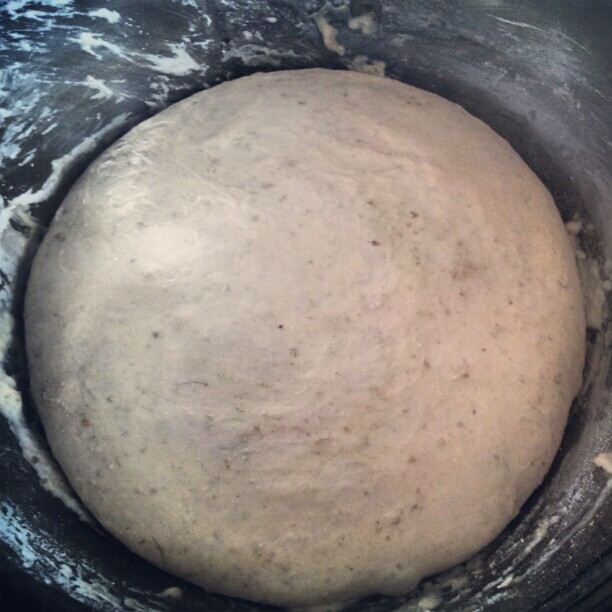 Short and Sweet doesn't have a full recipe for sourdough. There are two pages of instructions about how sourdough should work but I'm guessing that Lepard and his publisher probably want you to buy a copy of The Handmade Loaf. It's in my Amazon basket but there are so many more things I want to try (more than I'll manage before I finish this blog) that I've not yet purchased it. Thankfully, the well documented online guide from Azalia was really helpful getting the starter made and I then used Dan's Short and Sweet advice (plus some online research) to prep my first loaf. If you use Azalia's method, you really need to read all the comments too because there is extra clarification around some of the points there. 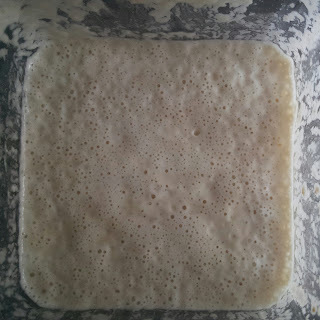 In a nutshell, however you feed your starter, a ratio of 1 part flour to 1 part water works. Where she's specified water at 20c, I've used the water from my kettle when it's cooled so I know it's roughly room temperature. 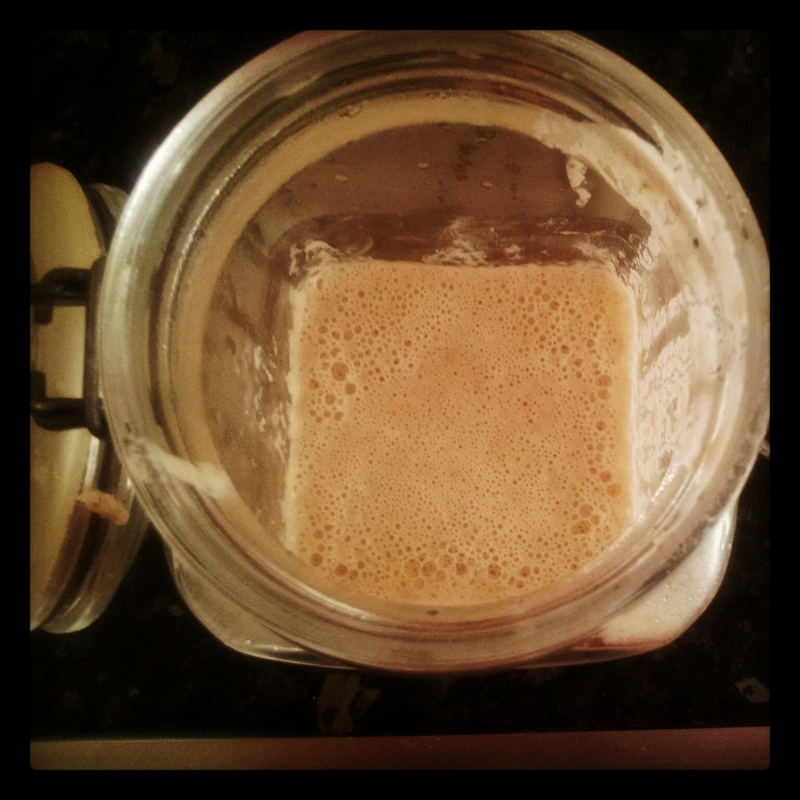 The one thing I hadn't really been prepared for is just how long sourdough can take to rise. Having done some research, the best ballpark figure I could find for how long it will take to double in size is between four and 12 hours. Even Lepard himself is vague on the subject. There are so many factors that can affect a sourdough rise apparently - from the quality of the leaven to the temperature of your room to whether or not there is an 'r' in the month (okay I didn't really read that, but I'm sure someone has said it somewhere). I then asked Twitter's opinion and @EversNanaJules replied that it's quite happy to be left to rise overnight. Great idea. So yesterday morning, I gave Derek one last breakfast in anticipation of starting the bread off last night as it works best 8-24 hours after feeding. But then I read another online article about how there is a window of opportunity for the rise of bread which is pretty predictable with commercially available yeast, but not so with sourdough. 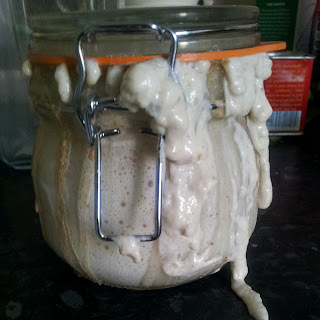 I decided that given the currently warm weather, I didn't want to slope off to bed and find that my lovely sourdough had peaked and fallen irreparably whilst I was asleep (I needn't have worried as Miss A was awake for most of the night again so I could've checked on it). So because I had the luxury of working from home today, I fed Derek again last night with 25g of flour and water so I could prep him this morning in that critical 8-24 hour window. I decided to use Dan's Easy White Loaf recipe because he tells you in the book the exact measurements for replacing the yeast, flour and water with leaven. The bit I missed was a comment a few paragraphs before these instructions that a small amount of rye or wholemeal flour will help stop the dough from being so sticky - a trait of an all white loaf. I also found I only needed 180ml of extra water so I'm glad I followed his advice to add it gradually rather than just putting it all in (he says 225ml of water). Because the dough was so sticky as I was kneading it, I added 25g of rye flour during knead two which certainly seemed to help smooth it out. First rise complete. Looking smooth Derek. He's so grown up! 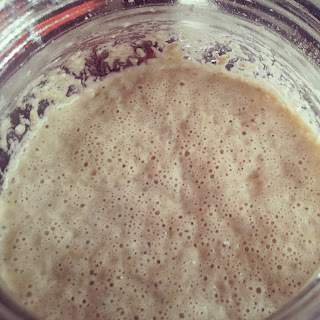 I left it the loaf starting its first rise at 6.45am - I love that my commute meant that I was at my desk by 6.47am (we live in a townhouse so I had to navigate two flights of baby-gated stairs with my coffee and laptop bag). With my lunch break at 12pm, I had a half-hour window for knocking back and shaping and it was then left for the second rise until 5pm. 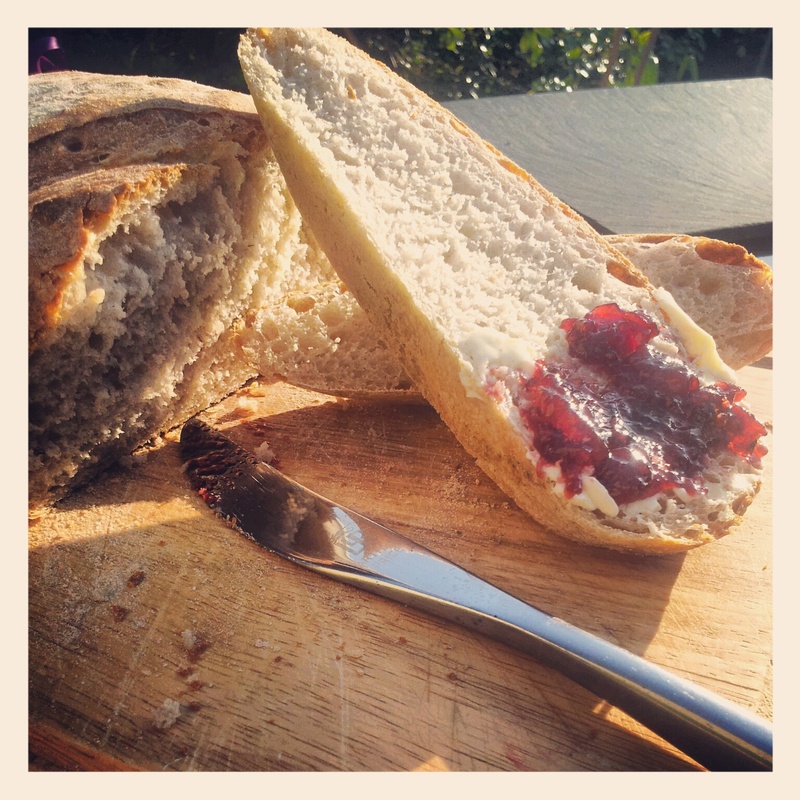 Thirty minutes in the oven, and a little time to cool on the patio table and I had me a late tea of sourdough with butter and jam. Lush! Was it worth the effort? Yes, actually it was. For the following reasons. 1) It tasted like bread that had been bought from a posh shop. Even better than regular homemade white. But not something I'd do every day purely because I don't have the time and I would come to not appreciate it. It's a really special treat. 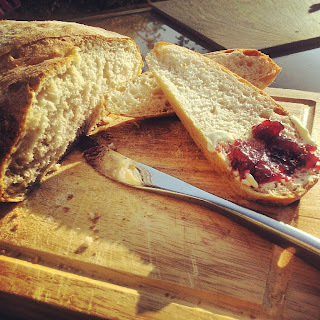 2) My Proud Mummy Moment (PMM) for the day was when Miss A looked at the loaf and rather than calling it 'Toast' as she does with all homemade bread, she announced that it was 'Sow-dough'. My heart burst - she's such a little foodie at only two. 3) Because it gave rise to an interesting conversation with the husband about bread containing yeast or sourdough - both of which are live and fungus related. He has now decided he's never eating bread ever again. I'll relay the full conversation on another post on another day.